VIPA (CHINA) Take Part in CBB 2016 with Industry Solution for High-speed detection. The high-profile 12th CHINA BREW & BEVERAGE (CBB2016) was held at Shanghai New International Expo Center from Oct. 11th to 14th, 2016. Through this exhibition, CBB introduces itself to Shanghai for the first time. As the most professional and authoritative exhibition among the domain of liquid food production and packaging in Aisa-Pacific with its largest and highest internationalization, it attracts a great number of professional manufacturers and customers. VIPA (CHINA) brought a smart solution on the show for the first time, and achieved good results. 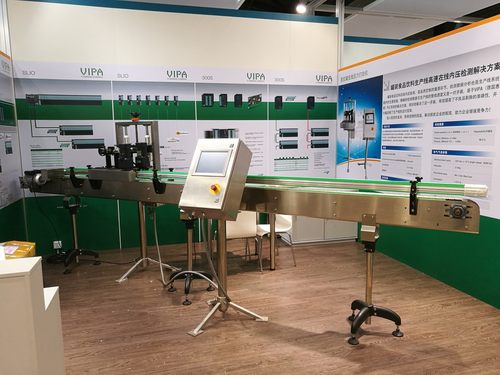 The device being exhibited, the on-line internal pressure detector for bottles/cans, is joint developed by VIPA (CHINA) and Jiaduobao (JDB) Group. This device is used to detect the inner pressure of bottles/cans after fulfillment and sterilization online. Short signal response time, fast AD/DA conversion, fast internal data transfer, short CPU cycle time, High calculation speed, etc.. Fortunately, we are able to satisfy all the requirements base on the control system with SPEED 7 technology. This joint developed device can be equipped with both 300S and SLIO control system; moreover, touching or non-touching detecting mode can both be realized. Currently, the device is able to examine 72000 bottles per hour on line and is proven to be precise and stable. It has been equipped on many production lines of JDB Group for several years and produced respectable economic profit. The device attracted large attention during exhibition. Some of the internationally renowned machine builders wish to have this device equipped when providing production lines to their customers. Some production and equipment managers from well-known national beer and beverage companies also came to the booth and showed great interest in this product. Furthermore, there are professional selling agencies of this area showing intention of cooperation. 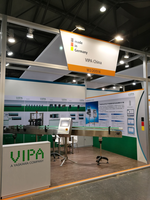 The successful exhibition demonstrated the advantage of VIPA’s PLC in efficient data collection and high speed performance. It revealed the potential value of this device not only in beverage and packaging industry, but also in the domain of high speed inspection machine such as product weighting system. The experience we gained from this event is a big treasure and will greatly contribute the creation of marketing strategies in the future.